To make a skin for the start menu you need an image editor that can create bitmaps with alpha channel (like Photoshop, Paint.NET or Gimp), and a resource editor (like Visual Studio or Resource Hacker). To install the skin, simply copy the .skin file to C:\Program Files\Classic Shell\Skins. Classic Shell 4.2.1 introduced the Metro skin and new skinning abilities to use color sets from Metro/Modern UI. Obviously this skin can only be used on Windows 8 and above. 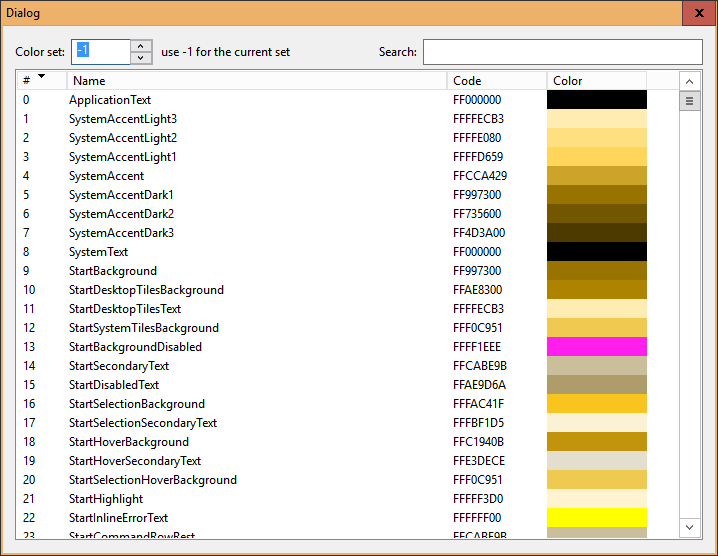 Use the Classic Shell Utility (a separate downloadable tool) from here: http://www.mediafire.com/download/3ukeryzw41qpfz8/ClassicShellUtility.exe to see the different color sets. The Metro skin uses these colors so the skin can be edited in Resource Hacker to make it use a different color set. You can sort the results by name, by ID and filter the names. Press F2 to copy the color name. is it possibel to add a colorChooser to the skin menu. I'd rather not. If you can change the background color to any color, then the text color, the selection color, etc, will all have to be customizable. It will become quite messy for the average user. Also for many skins the base color is part of a single bitmap, so it is not possible to change it just by picking a new color. If you want to provide multiple color options for a skin, have a look at the skin variations. One example is the Luna skin with 3 variations - blue, olive and silver. The advantage of this approach is that a variation includes a whole set of modifications to the base skin that are designed to look nice together. It can include colors, bitmaps, and even font changes. My skins all are solid colored so i don't need no bitmaps. So all could be edited by colorChoosers. Ok, i have created multiple variations for my skin now. The border is shown when the opacity is "solid". You need some other setting like "region" or "alpha" to get rid of the border. I'm not 100% sure, but I think you will need a bitmap for the menu if you want to use something other than "solid". is there a possibility to blur the background shining through the menu like it is in Win7? Windows 8 doesn't support blur. The only program I've seen that tries to emulate the blur is ViStart, and it doesn't look very good. just googled it, and from the screenshots i don't think it looks that bad, the particular blur seems a tad strong (but they call it ultra blur..), but im sure you can tweak it; although he does mention quite alot of work was put into its creation.. The problem is not how to blur the image. It is capturing the image behind the menu in the first place. It is actually impossible if there is animation going on. Also once you start opening sub-menus that overlap, it gets even trickier. Basically on Vista and 7 the OS takes care of compositing the windows on top of each other. For best results the blur must be done during that compositing. Without the cooperation of the OS it is not possible to get good results. cant you get a cropped screenshot with windows snipping tool?, run it, pass it fake mouse movements, and use its outputted image, its a pretty light program, but i dont know what kinda delays you would be looking at. this blur-feature would be really great. Maybe with editable blur-factor from 0-100 (by skin). I think it would work when capturing the background once when clicking the start-button (open the menu). It's not necessary capturing animations. And i dont think users will watch films with opened start-menu. Maybe you could give it a try.